Organic Neem Oil and Coconut Oils, Red Apple Vinegar, Rose Geranium, Grapefruit, Sweet Orange, Ylang Ylang and Eucalyputs Essential Oils. 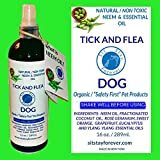 Use Neem to repel and manage fleas, Ticks AND MOSQUITOES! Regular use of this spray will disrupt the egg/larva/adult life cycle and help eliminate pest problems. Rub coat in opposite direction of growth, mist body, belly, legs and tail. Neem Oil has Anti-Fungal and Anit-Bacterial Properties. Our formulation of great smelling insect repelling essential oils helps to make a better smelling spray.